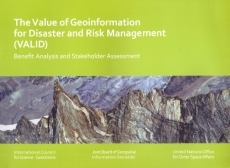 In July 2010, the Joint Board of Geospatial Information Societies (JBGIS) and UNOOSA/UN-SPIDER published ‘Geoinformation for Disaster and Risk Management – Examples and Best Practices’, a compilation of case studies that provides information on what can be done with geoinformation in support of disaster and risk management including methods, systems, applications, and experiences. As a next logical step, a second project called "The Value of Geo-Information for Disaster and Risk Management (VALID) - Benefit Analysis and Stakeholder Assessment" was carried out with the goal of offering complementary information about the value of geoinformation – an evaluation of benefits. A publication to that end would further help to raise awareness in the political and programmatic environment and to contribute to setting priorities in research and development. Objective: The intention of this second project of JBGIS and UNOOSA was to produce a publication to illustrate the economic, humanitarian and organizational benefits which can be realized by applying geoinformation to disaster risk management, based on analyses of representative cases, and on an expert stakeholder assessment. Two-fold approach: Two complementary methods were applied in this project in order to ensure a holistic view on the benefits of geoinformation for disaster management and best possible coverage of the disaster management cycle. Socio-Economic Benefit Analysis: In a classical Cost-Benefit-Analysis the costs of an investment were compared with the monetary value of societal and economic benefits generated thereby. Whereas the costs of a given geoinformation product can be easily estimated by any geodata or GIS provider, monetizing its societal benefit is more complicated and fuzzy. A Call for Papers was issued, addressing the scientific community in the field of socio-economic research on disaster management. Contributions were based on analyses of real disaster cases rather than on theoretical approaches. Expert Stakeholder Assessment: A reference set of different geodata product descriptions was identified and distributed to a group of potential users (practitioners as well as planners and decision-makers, affiliated to public disaster management bodies, international organizations and NGOs), together with a template for product appraisal. This template specified a list of criteria related to various aspects of benefit. Based on a normalized rating schedule, the experts evaluated all reference products according to the beneficial impact which can be attributed to their application. The outcome is a differentiated evaluation of benefits, which can be supplemented by a cost estimate of its implementation.